A November 30 Arizona Republic article by Glen Creno (Man dies before he can receive transplant) quotes the Governor as saying "The state only has so much money and we can only provide so many types of care". Meanwhile, she continues to squander money on non-essentials, such as her Arizona Centennial Museum. Hogwash from the Governor’s office? Correspondence (email) with the Governors office (from last spring) about converting the Arizona Mining and Mineral Museum into the 5C Arizona Mining and Mineral Museum is included in the appendix to this post. The Governor’s office claimed the change was primarily motivated by a need to cut cost. The Arizona Department of Mines and Mineral Resources (ADMMR or DMMR) has now been moved out of the museum building and the entire building has been assigned to the Arizona Historical Society. ALL of the rent money from ADMMR was transferred to the AHS so that they can maintain the building for Centennial Museum use. The ADMMR budget problems are now even worse than they were. They do not have enough funding to pay the remaining 3 employees for the rest of the fiscal year. So, was the change really motivated by a need to cut cost? Or, was the plot to convert the mineral museum into another history museum just a hoax cloaked under the guise of cost reduction? I really wish you would spend one hour with the curator at the Arizona Mining and Mineral Museum and ask her to explain how the museum helps teachers meet state mandated standards for earth science education. Then, you would understand how the Centennial Commissions current plan to use that building for the Centennial Museum will be so devastating to K-12 education. primarily one of the reasons DMMR and Governor's office started looking at moving the staff and records of DMMR to less costly facilities, and re-purposing the MMM. That is where idea of the privately funded Centennial Museum was brought forward. There is no single private entity funding the museum. The Centennial Commission will raise funds from any and all public and private sources to pay for the museum and other Centennial projects. In addition, the Governor has asked the modern day representatives of the original 5Cs to raise the money specific to their museum exhibit. There also is planned a rotating exhibit which will high light modern day industries important to Arizona, and funds should be collected from them as well. There will be a non-profit foundation formed to collect all funds received and pay for the various projects. The mineral collections and all other exhibits will be owned by the State, and the Centennial Museum will be under the direction of the Arizona Historical Society. The museum is intended to be a permanent museum and as long as the Legislature appropriates funds for that purpose, it will remain permanent. will be a permanent museum and will be state of the art and a big attraction for the public. We believe visitors will have a wonderful experience visiting the Centennial Museum which is expected to open in time for Arizona's 100th birthday! We trust we have adequately addressed your concerns. Thank you again for your message. Your statements about the rent are not true, and we have proof. Lyn White admitted, as over a dozen witnesses listened, that you are transferring the entire mineral museum budget (rent and salary) to the historical society to operate the 5C museum. There are also statements out or you office, now posted on the internet, which says the same thing. You are actually increasing the total expenditure for rent after you pay for the new office space for Madan Singh and his remaining staff. I had hoped that you cared enough about Arizona children to at least listen to how you 5C plan will damage K-12 science education. I see that you do not. I am the volunteer that has been traveling around Arizona promoting the mineral museum. I will now continue my travels around Arizona telling people about your Clinton speak, explaining why the mineral museum must "re-purposed", and about your willful disregard for K-12 education. Mr. Zimmerman, your e-mail to Constituent Services was forwarded to me for further comment. The rent for the museum space will be transferred to the Historical Society so they can continue to pay rent on the building. The Department of Mines and Mineral Resources will be moved into available space, hopefully, already being paid for by another agency. With all the budget cuts, there are many agencies with fewer staff and available space. I understand you would like to see the Minerals Museum continue as is, but with the enormous budget reductions we have seen in the past couple of years, and with more coming, The Department and of Mines and Mineral Resources has been so significantly cut that I believe it is now down to three employees (paid for with State funds). The agency can no longer adequately fulfill its statutory mission, of which the museum is only used as a tool to educate the public. Rather than close the museum and eliminate the agency, the Governor sought private sector donors to replace what is essentially a publicly funded special interest museum, with a privately funded broader spectrum special interest museum. The State's Centennial seemed a logical event to rally a fundraising effort. We hope donors will be generous so we can actually have a museum at all. The Director of the Arizona Historical Society has stated that she believes the entire minerals collection can be incorporated into the new exhibits, which will occupy both floors, not just the 1st floor. I personally hope that I can find adequate space for the Department of Mines and Minerals Resources in already rented space where it can have a public library and perhaps a smaller minerals museum, but rent could still be an issue in some locations, and obviously we don't have money to increase rent payments. I am also working on a plan to digitize all of the paper records of the agency so they will be backed up and would be available online, however that comes with a cost as well. While I understand your convictions and probably can do little to convince you to think otherwise, I did feel I should offer some additional information for your consideration. I hope this helps in some way. Is Governor Brewer’s pet project immoral? This blog was inspired by House Bill 2251 which the Governor pushed through to authorize her pet project, the 5C Arizona Centennial Museum. This blog is critical of that bill, because it does not just create another history museum. It replaces the existing and top rated Arizona Mining and Mineral Museum with another history museum. Many believe the existing mineral museum, the only earth science museum in the state supporting K-12 education, is a greater asset than another history museum (centennial museum). Also, it will cost many millions of dollars to downgrade the museum to a history museum. However, the human suffering associated with the prolonged, severe recession raises another question. Is spending tens of millions of dollars on a non essential museum at this time immoral? Take the recent example of 32 year old Francisco Felix of Laveen, Arizona. As reported by Michelle Ye Hee Lee in the Arizona Republic, Felix needs a replacement for his damaged liver. A dying family friend donated a liver for Felix, but he did not get a transplant. After being prepared for the transplant operation, he was discharged from the hospital without surgery. That happened because his Arizona Health Care Cost Containment System insurance quit covering transplant operations on October 1st. Obviously there will never be enough money to provide all possible desired medical service. However, is it ethical to withdraw previously covered care while there is still fat in the Arizona budget? The sole source and out of state contractor for the Arizona Centennial Museum estimated it will cost 9 million dollars. A completely nonessential associated project (Washington Street – Centennial Way) to be built past the front of the museum is costing 7 million dollars. In addition to that, the Arizona Historical Society will be provided millions of dollars a year to operate and maintain the museum. The AHS state budget was to be phased out because of the budget crisis. To support her pet project, the Governor not only restored their full budget, but increases it by over 50%. The AHS will now get at least over 6 million dollars of state money each and every year. Granted, the Centennial Way project is using Federal stimulus money and must be squandered on something useless, and private funding is being solicited for the 9 million dollar centennial museum. Nevertheless, do such nonessential expenditures in such a time of desperate need represent responsible leadership? According to Lee there are about 100 patients in the same desperate situation that Francisco Felix is in. Sixty of them are also in need a liver transplant that costs $200,000. If the Governor had not decided to keep the history museums open and to even add a new one, half of those 60 patients could receive the needed liver transplants. If the Governor and the community would ask private industry to help the underinsured like Felix, rather than support a completely unnecessary capital mall monument, all of them might be treated and there might even be 3 million dollars left over. Yet, according to Lee, the Governors spokesman (Paul Senseman) said that the AHCCCS cuts will not be reconsidered. Apparently, another history museum has a higher priority than the life of a 32 year old man. Francisco Felix and others will die not because there is a lack of money, but because of priorities within the Governors office that will not be reviewed or reconsidered. Note 1: Based on the attendance of existing history museums, few Arizonans are ever likely to visit the planned 5C Arizona Centennial Museum. 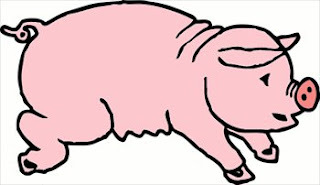 Note 2: How many other multimillion dollar pork projects remain in the Arizona budget as essential services are being cut? Each year, the Citizens Against Government Waste publishes their annual Pig Book. It identifies particularly egregious examples of money wasted by the Federal government. In 2002, CAGW teamed with the Goldwater Institute to produce the 2002 Arizona Piglet Book. This program is a membership-supported, nonprofit state trust agency that gives money to preserve and maintain museums pertaining to the history of Arizona. This program can proceed without support from government, and a nonprofit foundation could accomplish the same task and collect the same dues from its members without a commitment by the state government. So what did Governor Brewer do in 2010 as the cars from the long predicted train wreck began piling up? Why she INCREASED the Arizona Historical Budget by over 50%. Why did she do that? She wanted to Arizona Historical society to build yet another history museum. That was to be her pet project, the 5C Arizona Centennial Museum. Prior posts on this blog explain how, as part of that plan, she pushed through a bill that transferred the Arizonan Mining and Mineral Museum to the Arizona Historical Society. They also explain the many serious problems associated with that very unfortunate bill. This non-regulatory agency provides technical assistance to mining companies at taxpayer expense and runs the Mining and Mineral Museum. The technical and economic development assistance provided by state government to miners amounts to corporate welfare. That function, which subsidizes a remarkably small portion of the state economy, should be funded by voluntary fees or eliminated. The museum could be privatized and run by a nonprofit foundation. Rather than implementing the above recommendations, the Governor transferred over a half million dollars from the Department of Mines and Mineral Resources to the Arizona Historical Society. Then, she added even more money to inflate the historical society budget to its current level. Note 1: A February statement from the Governors office says that money will be added to the historical society budget “as necessary” to enable it to operate the 5C Arizona Centennial Museum. Note 2: This blog is not promoting restoration of the Department and Mines and Mineral Resources budget. It is promoting repeal of the bill that transferred Arizona’s irreplaceable mineral collection to an organization without the training to properly care for it. This blog has been documenting the extremely misguided changes the Governors office is making to the Arizona Department of Mines and Mineral Resources and the Arizona Mining and Mineral Museum. As stated in the Aug 17th blog post, the only significant publicity this has attracted is a single article in the Arizona Republic. Shortly after that article was published, the reporter no longer worked for the Republic. No other reporter has picked up the story. The Governors office misrepresented the change as cost cutting. That was a hoax. Although she said she would use “no public funds” the Governor is actually spending millions (during and economic crisis) to support her pet project, the Arizona Centennial Museum. The money is being funneled through the Arizona Historical Society, which got a 50% budget increase. The changes (which do not cut cost) jeopardize K-12 science education. Fieldtrips to the mineral museum are an experience remembered for a lifetime. Governor Brewer plans to deprive 3rd graders of that experience, and is not doing it to cut cost. Arizona’s last place in science education makes spending money to reduce science education particularly foolish. The new museum planned for the same building (5C Arizona Centennial Museum) is irrelevant in 2010. The Governor is jeopardizing other worthy centennial celebration projects. Hundreds of tips on these various angles of the story have been sent to various news media across the state. None have been interested. Do today’s news reporters do nothing but listen to the police scanner for stories? Are journalists and investigative reporters extinct? Pothunters are people who pillage archeological sites for artifacts that they add to their personal collection or sell for profit. They are generally regarded as looters and vandals. Unless they collect on private land they own, their activity is illegal. Pot hunting on public land, state of federal, is illegal and frequently prosecuted. Archeologists despise pothunters because they destroy contextual information. Artifacts that are removed from an archeological site without detailed study and documentation are useless except as souvenirs or collectables. Any scientific information that might have been gained by studying the artifact in the context in which it was found is forever lost. Disturbing the site in a haphazard way as they look for valuables or collectables, they also compromise the context of less valuable artifacts left behind. An item moved to a different archeological layer can never be properly interpreted. The opportunity to gather scientific information about an ancient civilization is forever lost. Even the collectible value of the artifacts may be compromised. They may be traded or sold to people not having the knowledge or interest to properly preserve them. Governor Brewer vandalized the Arizona Mining and Mineral Museum in much the same way that pothunters vandalize archeological sites. In this case, the items (rock mineral specimens) had already been carefully collected and documented. The Governor, either unwilling or incapable of understanding the mineral museum, ripped artifacts out of context. The Governors Arizona Centennial Museum bill transferred the mineral collection to the Arizona Historical Society. However, neither the Governor nor the AHS was interested in preserving the items in context with supporting documentation. The documents remain in the possession of the Arizona Department of Miners and Mineral Resources. They have been moved to two different locations where there security is compromised. Because all of the ADMMR rent money was transferred to the AHS along with the mineral collection, the ADMMR has no viable budget and will probably cease to exist. The future security of the documents is very much in question. Furthermore, the AHS is not qualified to preserve the mineral collection. Some are not chemically stable, and many are very fragile. The collection is subject to serious damage as it is handled and stored by untrained personnel. The Governor has behaved exactly like a pothunter, and deserves the disrespect normally directed toward pothunters. AHS involvement in Rio Nuevo apparently began with Rio Nuevo Board of Directors Resolution No: 2005-007 dated July 13, 2005. That document states that the ASM and the AHS were given $110,000 to have the firm of ConsultEcon perform an economic feasibility analysis regarding the relocation of their museums to Rio Nuevo. Information on AHS involvement is Rio Nuevo is included in Table 1 and Appendix H of the Crowe report. Design and develop a building program, site plans, and cost estimate to relocate the Arizona Historical Society exhibit halls to the cultural plaza that will be located on the west side of the Santa Cruz River. The information is sketchy, but it looks like AHS started with a 12 million dollar budget and spent 1.5 million of that. For that they got “a building program, site plans, and a cost estimate”. Did the AHS get competing design proposals (normally provided no cost)? Why did they prepare a 45 million dollar design if they were given a 12 million dollar budget? Was their Rio Nuevo contractor the same contractor they selected as the sole source contractor for the 5C Arizona Centennial Museum? Note 1: The Rio Nuevo management report shows 4 payments in FY 2009 and 1 payment in FY 2010 totaling $1,467,182. It does not indicate who the payments were made to. The report does not show the $110,000 for the 2005 feasibility study, indicating the Rio Nuevo records may be incomplete. Note 2: According to the article cited below, some of the history museum money may have been spent on construction drawings. The 2009 annual AHS report does claim construction drawings were completed. What’s that point on Governor Brewers head? 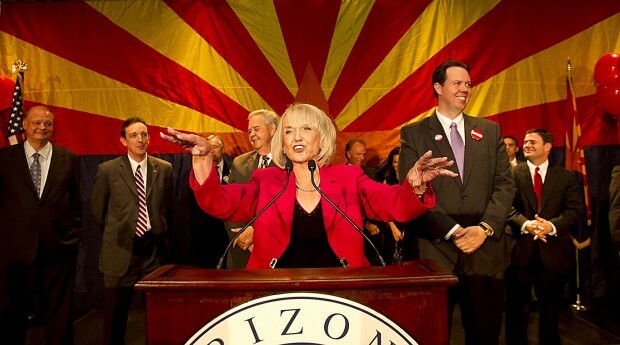 The Arizona Republics photo of Governor Brewer’s election win shows her with a pointy head. What is that point? As explained in the Oct 6th post, the Arizona Flag has a large copper star at its center. In the election win photo, the upper point of the star can be seen above the Governors head (Arizona Republic photo). That’s the star showing that Arizona was proud of its mining heritage when it became a state. It is also the star that the Governor clearly does not understand as evidenced by her 5C Arizona Centennial Museum project. The photo suggests the governor will never destroy Arizona’s mining heritage, no matter how hard she may try. She may succeed in destroying the current Arizona Mining and Mineral Museum, but it may reappear after she is gone. Note: The Governor cannot run for reelection in 2014. Can the election results help save the Arizona mineral collection? Governor Brewer herself appears to be the prime threat to the Arizona mineral collection and the historic mining artifacts, and she easily won the election. However, two propositions that she desperately needed to pass went down in defeat by over a 2 to 1 margin. Those were propositions 301 and 302. During the campaign, the Governor claimed to have the budget balanced, but she was assuming these two propositions would pass, giving her access to nearly $500,000,000 to plug budget holes. According to the Arizona Republic (1), the real deficit facing the Governor is now actually over $1.300, 000,000. With that kind of a major budget problem, how long can she keep hiding the millions she is funneling to the Arizona Historical Society to support her pet pork project, the 5C Arizona Centennial Museum? The money is actually hidden in plain sight. The budget of the Arizona Historical Society (administrator of the centennial museum) is a separate line item in the budget. As reported in a prior post, the Governor increased that budget by over 50 percent even as she allowed rest stops to be closed. The AHS budget is now over 6 million dollars. How long before someone figures out we don’t need to keep supporting 50 paid employees in history museums with little attendance while we lay off teachers, firemen and, and even rest stop janitors. Sooner or later, some one has to spot the recently bloated AHS budget. Then, the Arizona Historical Society will be history. True, six million dollars is small compared to the deficit. However, the expenditure is so obviously unnecessary that it should attract attention. Undoubtedly, it is also still not the only pork left in the budget. If the Arizona Historical Society is eliminated, as it should be, then the mineral collection will have to be assigned to another agency or department. Hopefully, the collections new home will then be at least somewhat qualified to properly preserve it. Such a scenario will by no means preserve or bring back the existing mineral museum as is. There is no way a mineral museum is going to be funded again either in the near future. However, the collection could at least be safely stored under competent oversight until the budget crisis passes. Arizona motorists were subjected to the ultimate inconvenience when ADOT closed 13 of the 18 Arizona highway rest stops. ADOT figures it costs and average of $320,000 per year for utilities and maintenance for each rest stop. They were supposedly closed because there were insufficient funds to operate them during the financial crisis. However, that is not true. There was enough money; it was just spent on the wrong things. Thirteen rest stops at $320,000 each is 4.16 million dollars. Where could that money have been found? The Governor could have closed the Arizona Historical Society museums instead. If she had been exercising responsible leadership that is what she would have done. Is there a taxpayer or voter anywhere in Arizona that considers access to a historical society museum a more essential service that a rest stop? The Arizona Historical Society Budget was 4.2 million dollars at the time, exactly what was needed to keep the rest stops open. The historical society budge was in fact scheduled for 20% per year reductions over five years due to the financial crisis. The Governor did not even make that planned cut. She restored all of their funds and then implemented a budget transfer to increase their budget by an over 50%. That transfer of funds happened while the rest stops were closed. Why did the Governor do something to apparently irresponsible? Because she is using the Arizona Historical Society to support her pet project, the 5C Arizona Centennial Museum. That’s the one she promised, last February, would use “no public funds”. To fund her pet project, she allowed the rest stops to be closed. That’s worse than mismanagement of public funds. That’s selfish and mean.